The long and painful wait is over, folks. At long last, we have our first look at Stranger Things 3. The Netflix show exploded into a bonafide phenomenon when it premiered in 2016, and it has continued to be a vital part of the pop culture lexicon ever since. But seeing as season 2 was over a year ago now, fans have been exceedingly anxious to learn more about the upcoming season. This trailer is genuinely great and does a wonderful job of not only immediately reminding viewers why the show is so beloved but also of hinting at some bold new directions this season could go in. The trailer opens on a sequence that is oodles of fun and a fairly clever subversion. Dustin returns home from camp, complaining to his new pet turtle (who is assumedly filling the Dart-shaped hole in his heart) that apparently none of his friends missed him while he was gone. Then suddenly, all of the electronic toys in his room begin to operate in unison heading for the door. This is pretty classic Stranger Things (in that it's pretty classically straight out of Poltergeist) and leads Dustin and viewers to believe he's about to discover yet another monstrous threat. But surprise, it turns out just to be Eleven goofing on him as all of his friends jump out to surprise him with a homecoming banner. 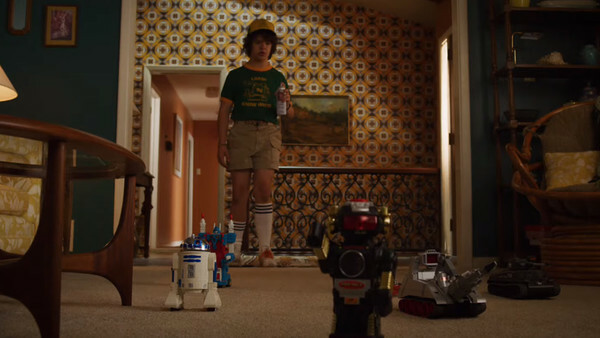 This clever twist alongside great callbacks like Dustin using the Farrah Fawcett hairspray that Steve taught him about in season two as a weapon, open this trailer with a bang, immediately giving viewers a sweet dose of that distinctly Stranger Things-brand of humor and horror they've been jonesing for.